I’ll be honest. Though I love to try out new technologies, when it comes to paying for my own personal equipment, I tend to stick with the major brands. 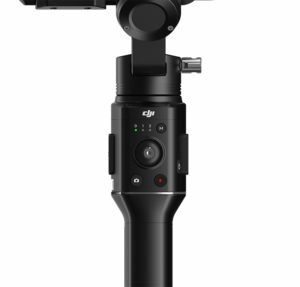 DJI has just announced the handheld smartphone gimbal I’ve been waiting for, but they also gave us a new DSLR gimbal. Looks like I’ve got to buying to do. Let’s start with the new DJI OSMO 2. Designed for your smartphone, this second generation gimbal for mobile filmmaking DJI’s “SmoothTrack” technology that detects and dampens out camera movement for a smooth, cinematic shot. DJI used higher strength nylon plastic to keep the OSMO 2 lightweight, and lower in cost. 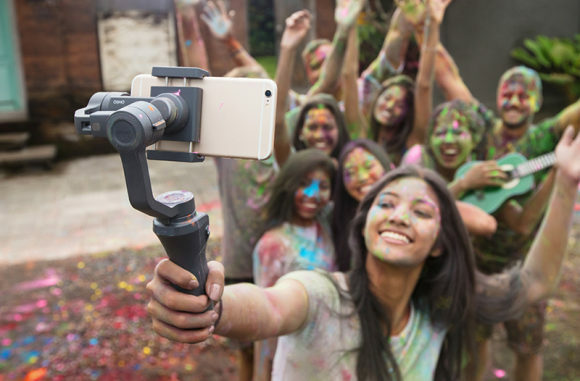 It has a two-way smartphone clamp, so a shooter can capture video either in standard cinematic landscape, or in portrait mode for live streaming to Facebook, Twitter and Instagram (yuck). The OSMO 2’s three button control layout also enables adjust a camera app’s settings, including ISO and shutter speed, and more. It also has a zoom slider to create digital dolly shots, which make the image look like you’re using professional quality sliders or dollies. With a rated battery life of up to 15 hours, the OSMO 2 can last well into the day, over three times longer than the first generation mobile model, and there’s a USB port to plug in your phone and use the battery as a power bank. 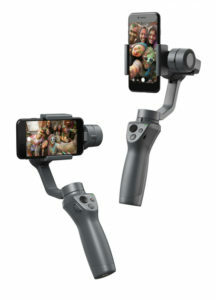 The heart of the OSMO 2 is DJI’s Go Mobile app, which provides intelligent features such as ActiveTrack for following your subject while they are in motion, Motion TimeLapse with up to five different camera positions to choose from, Hyperlapse for that time lapse look while the shooter is moving the camera around, and even live streaming connectivity. There’s also Panorama, Long Exposure, and LightTrail modes. DJI also lists the OSMO 2 MSRP at a crazy $129! That convinces me that my patience is being rewarded. And it will be available for preorder first at the Apple.com starting January 23, 2018. Then available on DJI.com, Apple retail stores and authorized resellers in late February. On the DSLR side, DJI is also launching the Ronin-S, their first handheld stabilizer for DSLRs and Mirrorless cameras. DJI has packed some of their strongest high torque motors to enable their new gimbal to provide smooth, cinematic movement that is on par with their original Ronin Gimbal Rigs. 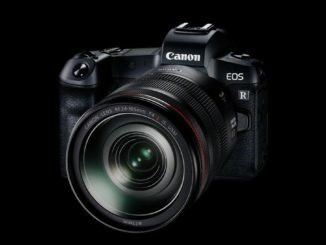 Camera and lens combinations from Canon’s 5D Mk. IV to the Panasonic GH5. The smart stabilization system also is designed to re-balance depending on which zoom lens the camera man chooses. Ronin S also works hand in hand with your camera’s optical image stabilization schemes to keep from over compensating. Button modes include Push to pan and tilt, a speeded up rebalancing through Axis lock, Smooth Track settings, and record, stop and start through wifi control of your camera. DJI has also added a high precision joystick for complete manual control to frame your shot as you see fit. 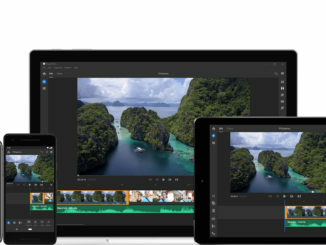 Smart modes include Panorama, Hyperlapse, Track and CamAnchor, and a sport mode for capturing fast action. 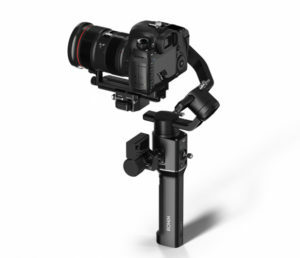 OSMO S also supports many DJI accessories including DJI Master Force, DJI Master Wheels, external focus motors, and a cheese plate adapter. DJI is also planning a dual handle accessory to convert your Ronin-S into a kind of Mini Ronin when more control is required. Ronin S will be available second quarter of 2018, price TBD.